When a celebrity stylist curates her own wedding, the fashion is phenomenal. Weddings are always stressful but can you imagine being a stylist and having to figure out your bridal looks? The pressure! 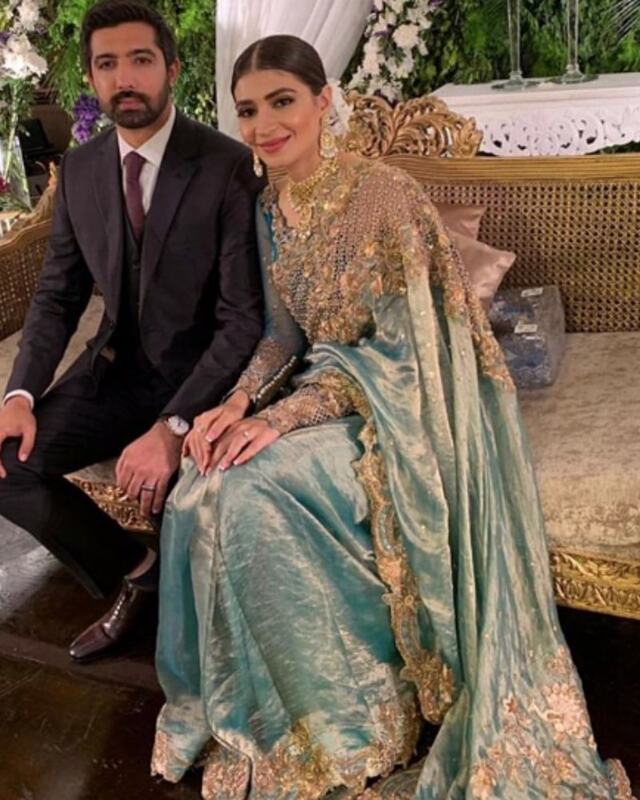 That said, they're better equipped than the average person aka normies to look the part and celebrity stylist, Mehek Saeed who got hitched last week to restauranteur Ammar Mohsin, knocked it out of the park. Mehek is a fashion journalist and stylist, who's also a contributing editor at Grazia Pakistan. 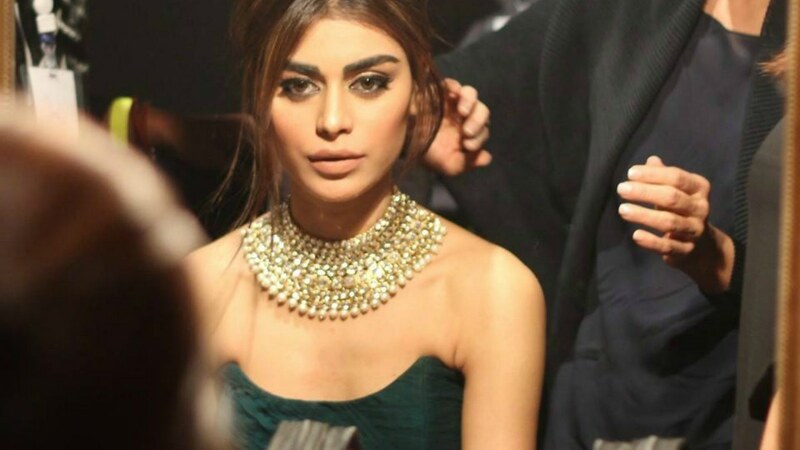 At any given fashion week, she winds up on the best dressed list and has styled the likes of Sajal Aly, Ayesha Omar, Ahad Raza Mir and Syra Shahroz to name a few. From pops of neon to statement head pieces, she stayed true to her style aesthetic. 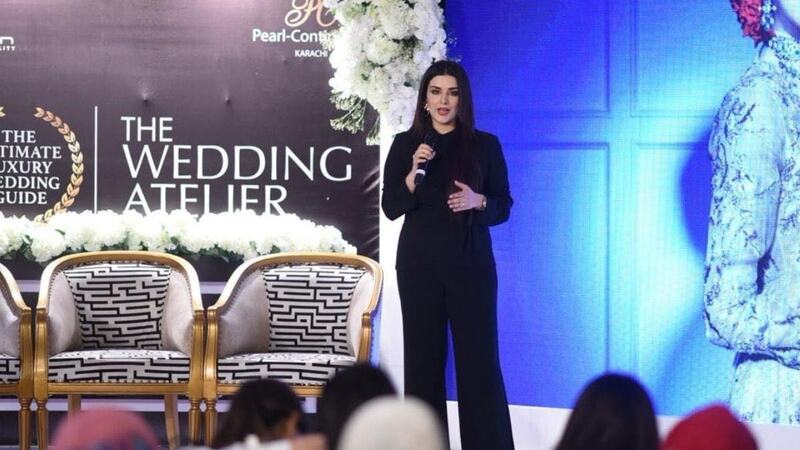 Of course it helped that she's knee deep in the Pakistani fashion scene and also that Ali Xeeshan gave her one of her ensembles as a wedding present. 7 enchanting looks later, we had to ask: which one was her favourite? "It’s hard to say because all of them were so different but I think it would be a tie between my Ali Xeeshan and The House of Kamiar Rokni look. They’re my favourite two because although I had fun experimenting with styling, I felt most like myself wearing those clothes." And after a week long of festivities, her advice for to-be brides is to have fewer events that she did: "I know this isn’t fashion related but I started off wanting one event and the rest just happened somewhere along the way. Start small. Also, start early. Designers usually take a long time to get the outfit right especially if you’re a perfectionist like I am. Most importantly though, remember to enjoy every bit of it even if you feel like the world is going to come crashing down soon!" 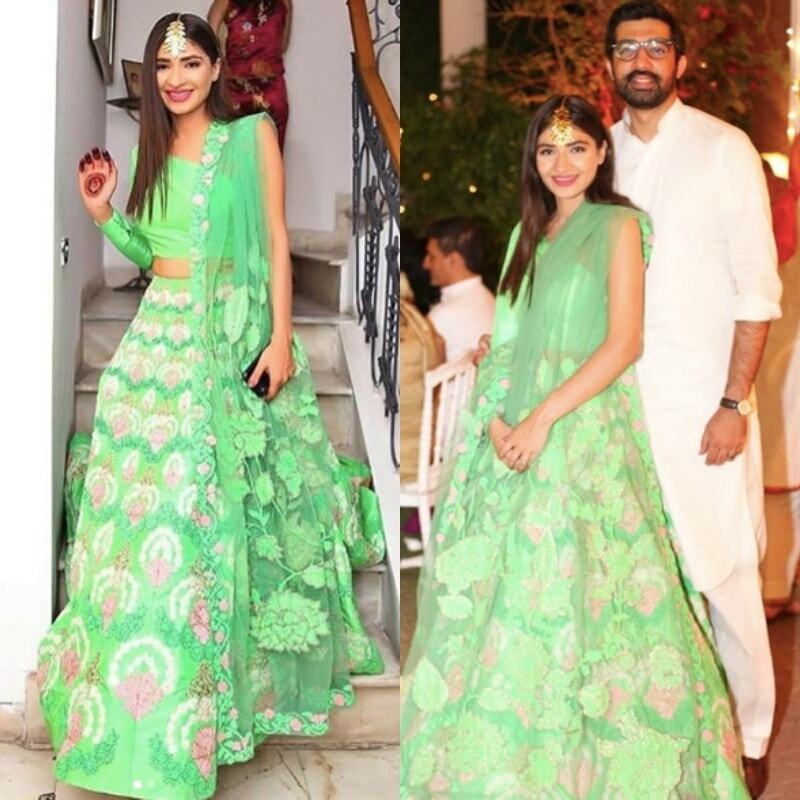 Mehek wore a neon power suit for her pre-wedding party which was unusual, quirky and sophisticated all at the same time. Makeup artist Shoaib Khan gave her a nice pink lip coupled with glowy skin. "I went to Hussain Rehar with the knowledge that he can cut a great pant suit. Luckily, he had just gotten some neon green fabric in and we both decided that a suit in that colour could be the exact statement a wedding kickoff party needed, especially since the colour is trending these days. I styled it with smiley face Swarovski hair pins and ASOS heels that read “he was like” and “I was like”; I thought that was apt for the event," she shares. 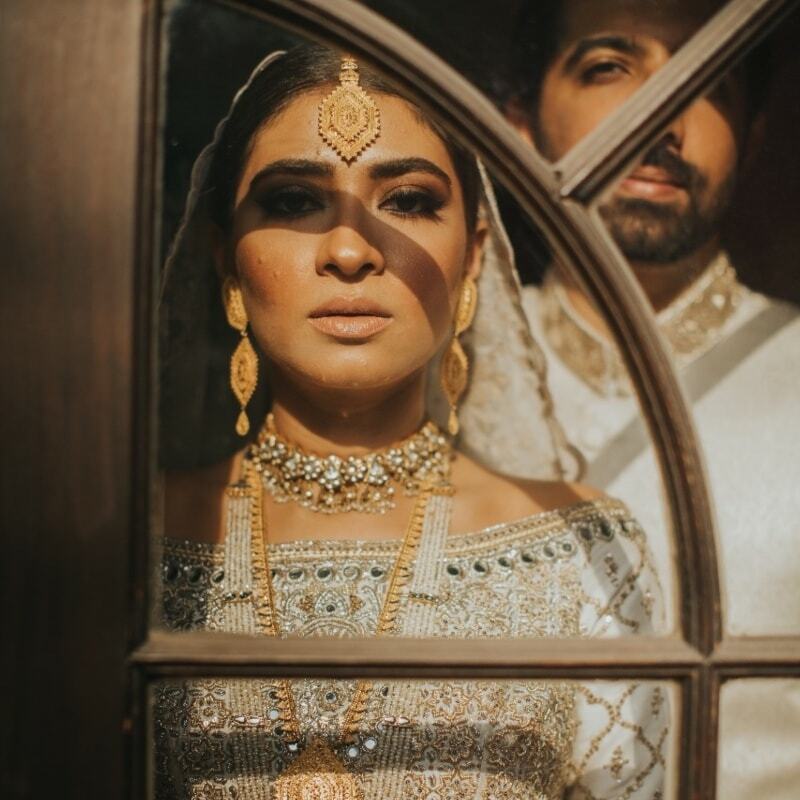 Her nikkah ensemble was a dreamy one and she was in good hands with makeup pro, Fatima Nasir who also did her looks for the mehndi, baraat and valima. She exclaimed, "My blush pink Misha Lakhani outfit was so much fun to wear and spin around in which I did a lot of on the day! We decided to go with a light pastel colour since it was my only day event and added Misha’s signature crushed length to the bottom, pairing it with some baby’s breath in my braid." We love that Saeed was confident enough to wear the same colour twice; not a lot of brides do. "By now, it’s obvious I’m really feeling the greens. 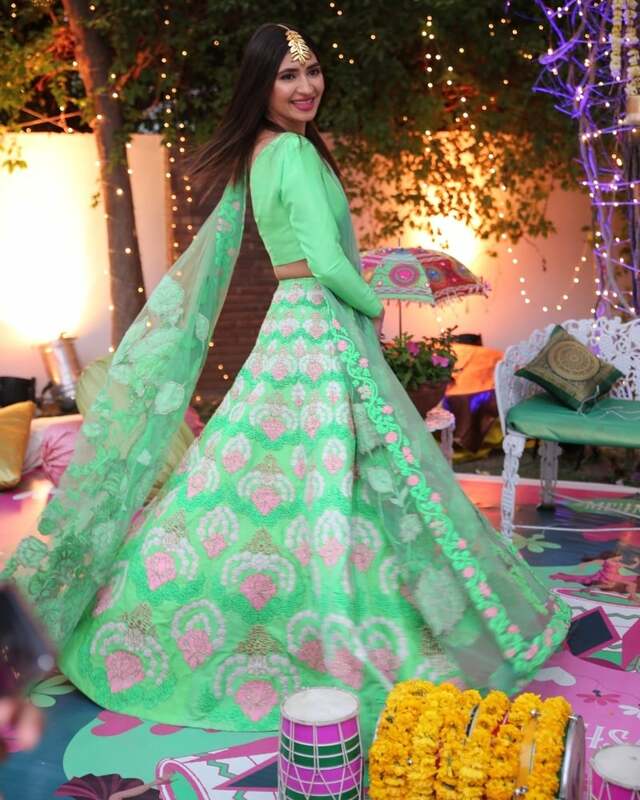 Ali Xeeshan customized an appliqué lengha and dupatta with a plain green one shoulder choli. 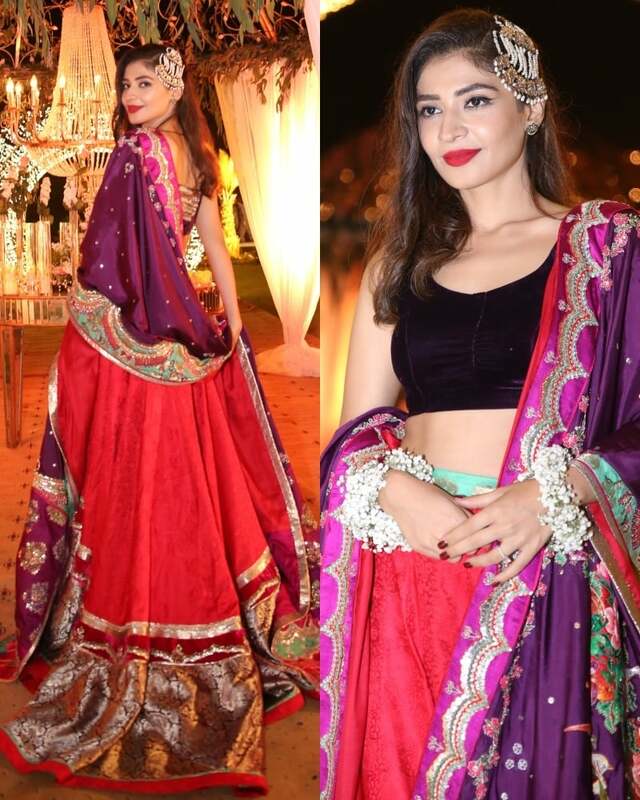 I styled it with a Zohra Rahman teeka I ordered from her first few collections and kept my hair poker straight." The teekas she wore definitely stood out and are further proof that Mehek knows what she's doing; they really framed her face well. When we tell her that, she says, "Thanks! I think teekas suit the face shape I have because they add some definition to the face. I think the this outfit called for something experimental and fun and the teeka made it one of my favourite looks from the week. 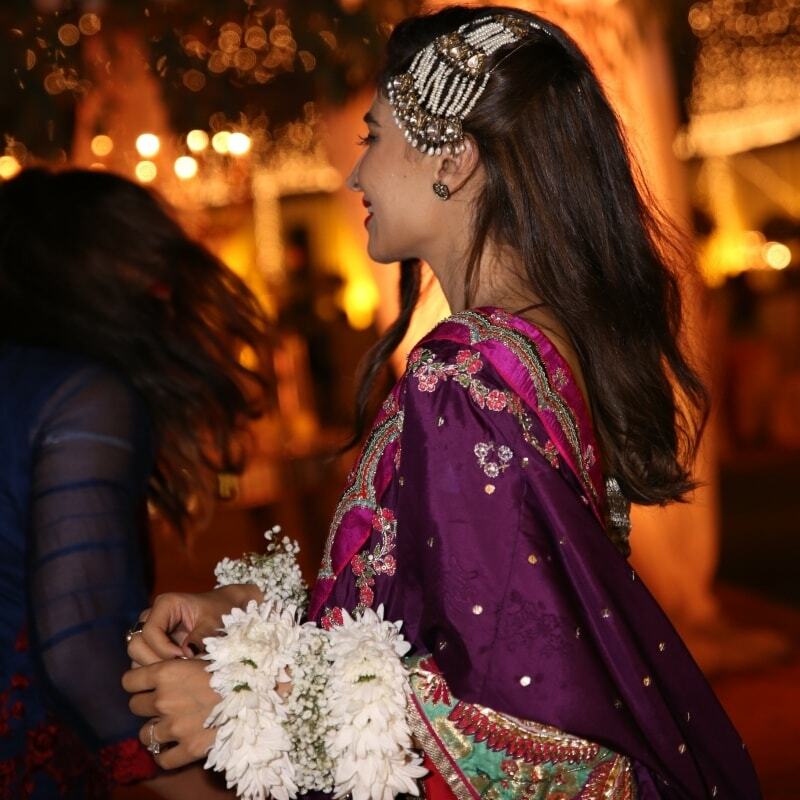 "I wore a floral jewellery teeka on the mehndi made from just white flowers because I think they look the best with any colour you’re wearing. 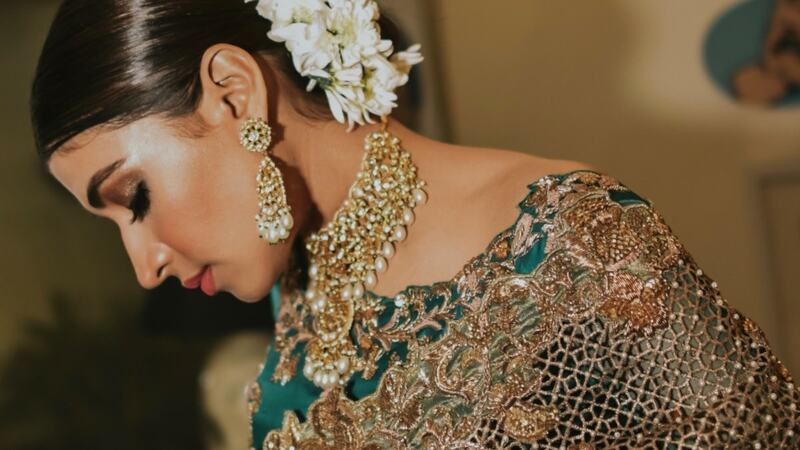 I wore a gold teeka on the baraat day which I got made to match the rest of my set." We loved the simplicity of this look and Madiha Qaiser did a great job with the makeup, keeping it natural but not really natural. She chose to keep it traditional for her qawwali and "traditional elegance at its best is Rano’s Heirlooms," she says. "I couldn’t think of wearing anyone else. The outfit was a farshi which made for a dramatic trail and as the bride, I’d say it did manage to make me stand out. I styled it with classic red lips, courtesy of Saad Samie and my hair pinned to one side." Mehek decided to skip the lehnga choli route and wore a festive deep blue shalwar kameez instead. 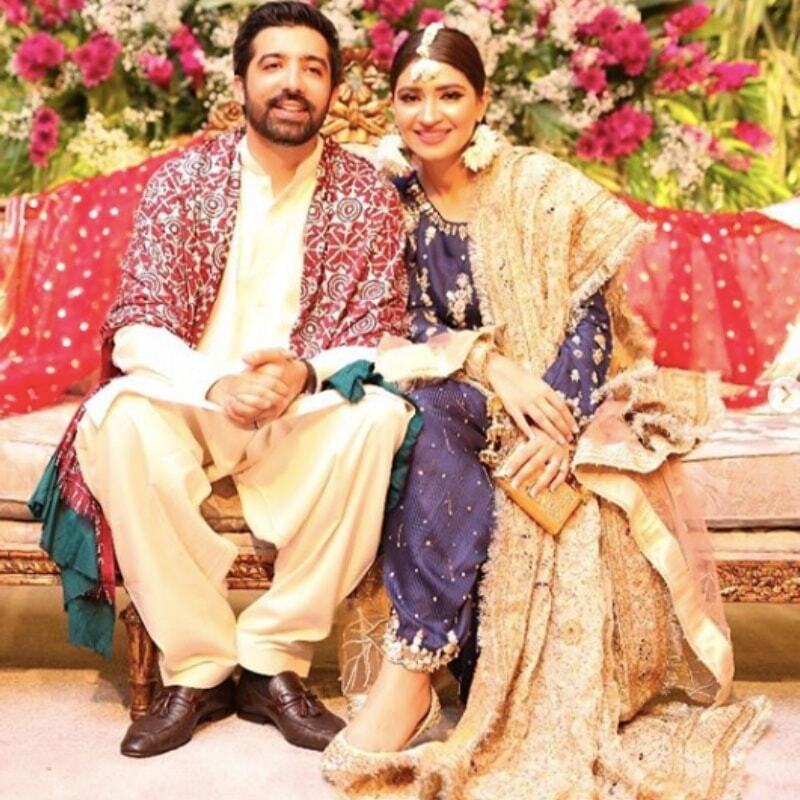 "My mehndi outfit was by Hira Ali Studios, Hira and I talked about not doing conventional colours like yellow and orange for the mehndi. I was also certain that I didn’t want to do another lengha because I’d worn that on other days and because it was a very typical look. Instead, we went with a royal blue shalwar kameez which I matched with my mother’s valima dupatta. 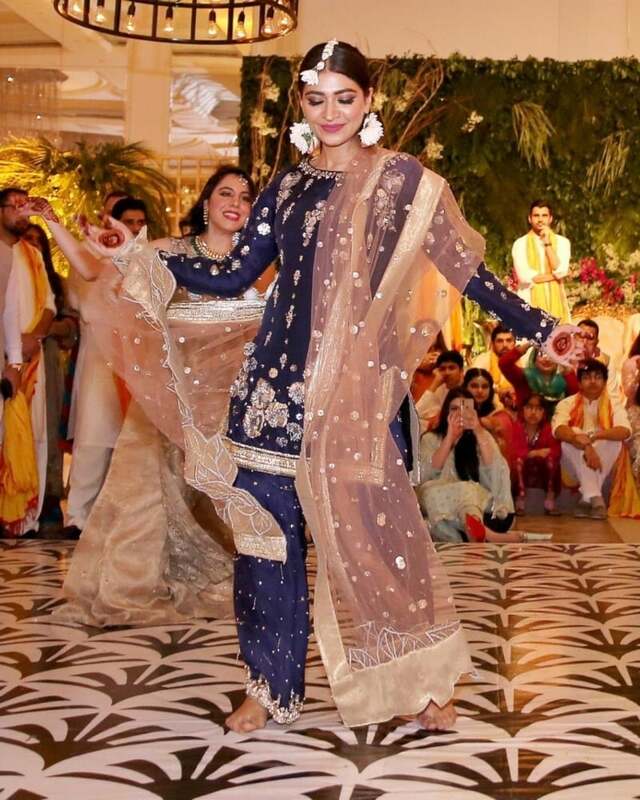 Hira’s experimental and fun embroideries on a traditional silhouette like that of a shalwar kameez turned out to be very interesting," she told us. "Don’t follow the herd and think about what your personality type is and what kind of a bride you really want to be. Ask yourself questions like, do you want to dance at your mehndi? If yes, make something you can be mobile in… for me it was a shalwar kameez." 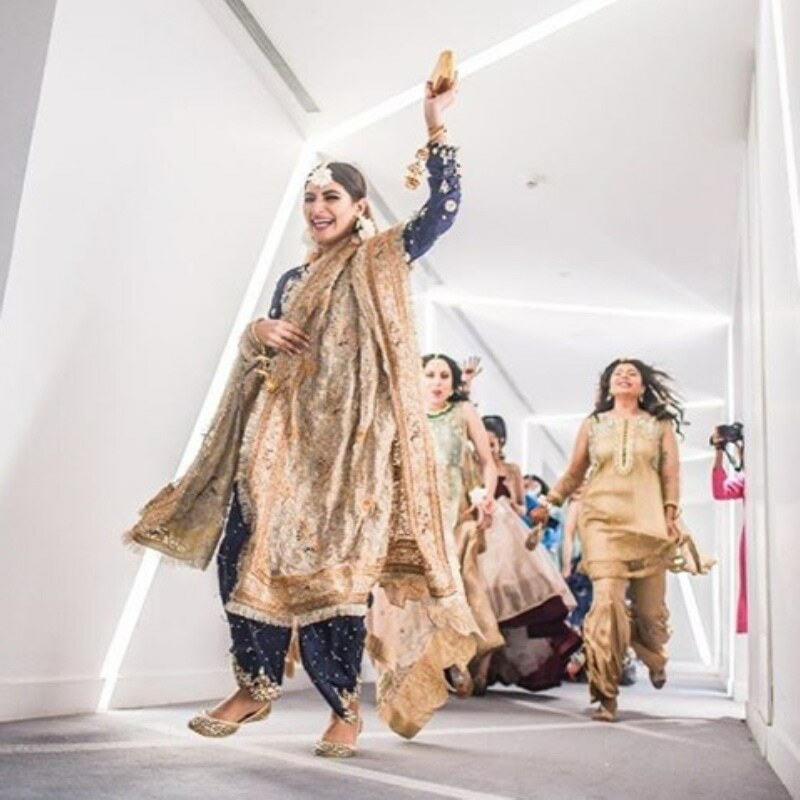 Coming to the baraat, she knew she just had to wear Kamiar Rokni, adding that he was "the only designer I knew I had to have a piece of on my wedding day". "I’d always been a fan of his work but his last collection at fashion week, Moonrise was a complete visual delight and a display of what bridal fashion should look like if one tries pushing the envelope. The rest just fell into place as I thought about what I wanted to do on each day," she explained. "And to him, I just want to say, Kami, thank you for the bridal of my dreams. I went in knowing that I wanted to wear ivory and gold on my day. I showed him my mum’s heirloom jewellery that I planned to pair with it, which was solid gold and very tribal-esque. Together, we designed a look he’s never done before and I was over the moon to be the one he did it for." 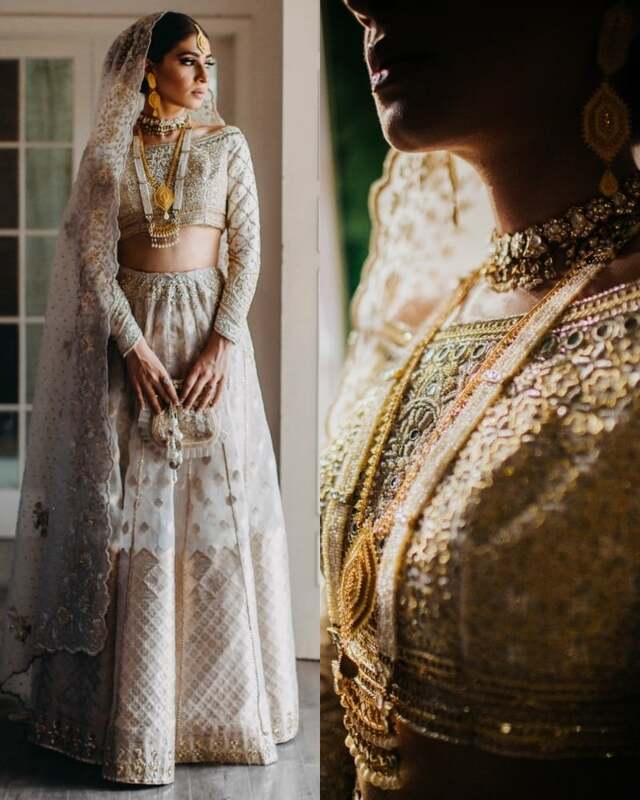 "The bridal consisted of an off shoulder choli with a customized Jeff Koons design (that my husband Ammar had on his sherwani as well). It also had a fitted full length skirt inside with gota work that showed through a translucent lengha he’d gotten handwoven for me. 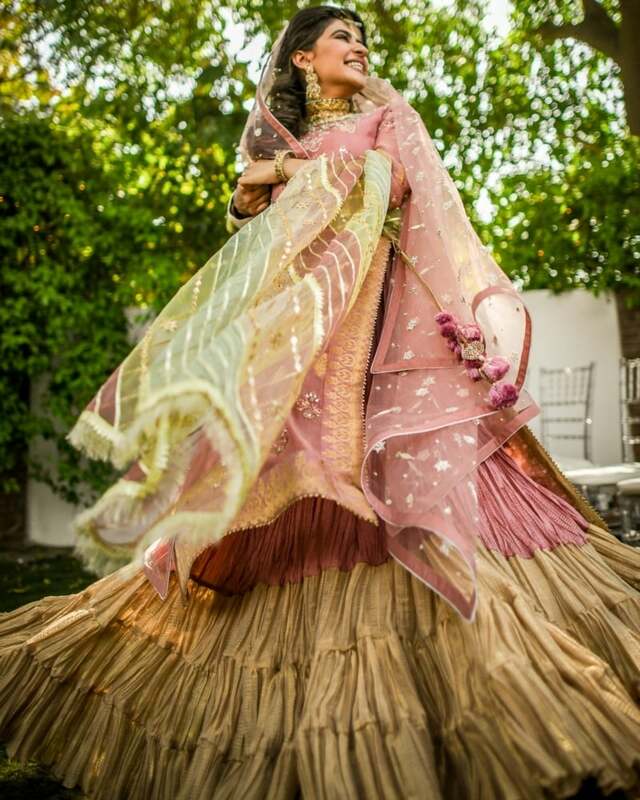 The dupatta was light and had a lovely scallop design around it that showed when it was on my head." 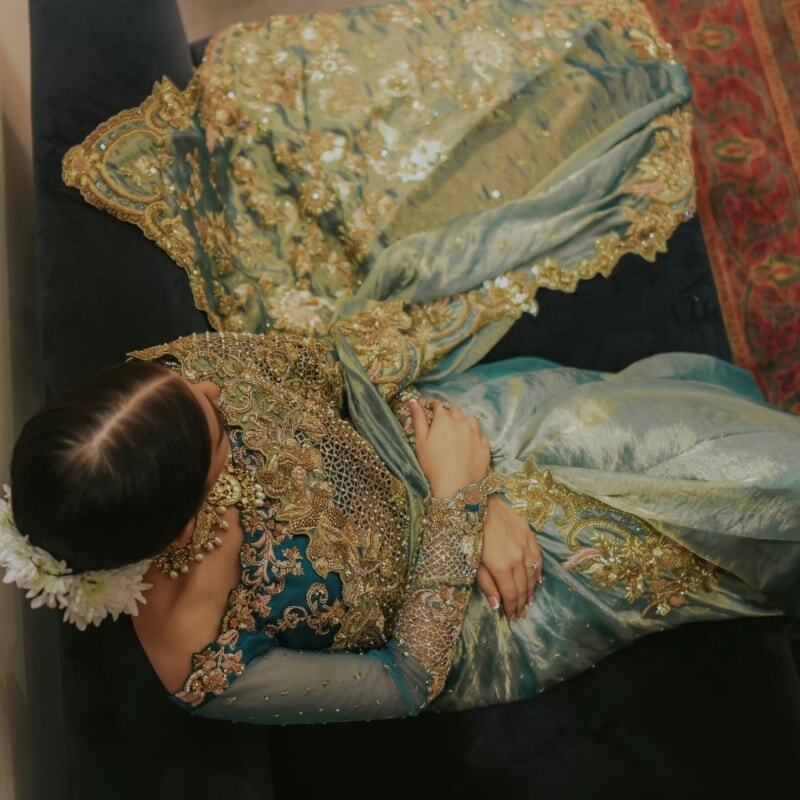 The wedding festivities finally came to and end with the valima, for which she opted for an Ammara Khan sari. She told us: "I fell in love with this sari at her studio; it had dull gold kaam and cutwork on it. She had it made for me in turquoise tissue and it turned out spectacular. I styled it with chrysanthemums around my bun and a classic makeup look. People don’t normally wear saris at their valimas though I can’t imagine why, they always look elegant and can be passed down to generations as is!" Who wore the better red carpet gown at the Hum Style Awards 2018? "Mehek wore a neon power suit for her pre-wedding party which was unusual, quirky and sophisticated all at the same time." It was made in Wakanda using vibranium.